KT taping offers a comprehensive array of therapeutic benefits and can be a complementary addition to a Bowen Therapy treatment with the Mind, Body & Spirit Centre’s Bowen Therapist, Karen Alexander. KT taping can usually be left on for several days or even up to a week so the therapeutic benefits are available to the injured area 24 hours a day. This can significantly accelerate the healing process from trauma, injuries and inflammatory conditions. 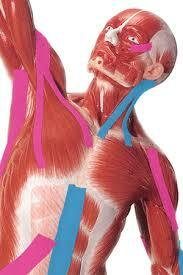 KT tape is a flexible elastic tape that moves with your body whilst providing support to injuries without slipping. Pain relief and muscular support for weak or injured body parts is achieved by supporting these areas with the kinesiology tape. It can also assist with swelling reduction of swollen or bruised tissue as it provides a passive lift to the skin via its elastic properties causing a vacuum effect allowing lymphatic and venous drainage systems to drain quicker than without KT taping. Karen, through her knowledge and experience, will identify whether KT taping would be a beneficial addition to your Bowen Therapy treatment. Contact the Mind, Body & Spirit Centre on Ph 0422 630 127 for treatment bookings.